the group displayed a unanimity, polished technique and musical imagination that I thought had vanished from the scene with the demise of the Beaux Arts Trio. To name a piano trio after the popular nineteenth century German poet Christian Morgenstern was the inspiration of Catherine Klipfel, piano, Stefan Hempel, violin, and Emanuel Wehse, cellist, who met during their studies at the Folkwang Conservatory in Essen, Germany. After only two short years of working together, the Morgenstern Trio emerged on the German Music Scene by being awarded top prizes and awards, such as the prestigious US Kalichstein-Laredo-Robinson Trio Award in 2010. 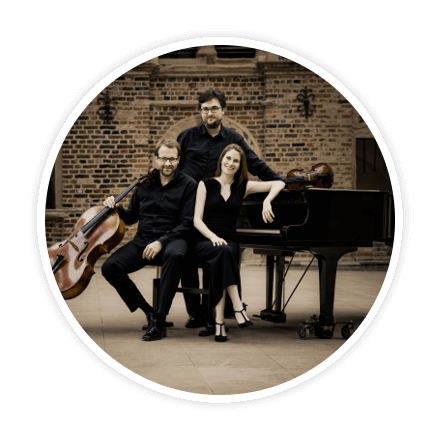 For the twenty prize concerts, the Morgenstern Trio has received superlative reviews and immediate re-invitations for following seasons. This prize catapulted them onto the scene in the USA with performances in Washington, DC's Kennedy Center and at Carnegie Hall and other venues in NY, followed by concerts in such cities as Chicago, Detroit, Kalamazoo, Carmel, Louisville, Lexington, to Palm Beach. The Washington Post wrote: "the group displayed a unanimity, polished technique and musical imagination that I thought had vanished from the scene with the demise of the Beaux Arts Trio". A few years earlier, the trio took First Prize at the International Joseph Haydn Competition in Vienna, followed by two second prizes: the "Fifth Melbourne International Chamber Music Competition" and the prestigious "ARD Competition in Munich", where they also received the audience prize. In the previous year they had already won the competitive scholarship of the "German Music Competition" and most recently, the Morgenstern Trio was selected by the ECHO (the European Concert Hall Organization ) for the "Rising Star Series" granting debut concerts on all the European important stages in Paris, Vienna, Amsterdam, Cologne, Brussels, Birmingham and Stockholm to name a few and was named "ensemble in residence" at their Alma Mata, the Folkwang Conservatory. The Germany's national program for young musicians and the "Best of NRW" Concert Series has provided the Morgenstern Trio a noticeable platform with numerous concerts across Germany and live radio appearances to showcase their already consummate musicianship. The Summer 2014 marked their inauguration of their own Morgenstern Festival in Germany offering eclectic programs with guest artists. Other festival appearances include the Pablo Casals Festival in Prades/France, the Festspiele Mecklenburg-Vorpommern, the Heidelberger Fruehling, the WDR Musikfest and the Kuhmo Chamber Music Festival in Finland. The debut LIVE CD released in 2008 which features works by Beethoven and Brahms has captured presenters and critics alike. Mentors, such as the Alban Berg Quartet and Menahem Pressler have given the Morgenstern Trio invaluable coaching and musical insight. "highly charged performance created a powerful impact, imbuing the music with an undercurrent of simmering restlessness"
TREE STARS SPARKLE - "breathtaking virtuoso-criterion"
"highly charged performance created a powerful impact, imbuing the music with an undercurrent of simmering restlessness." "Bravissimo! Wonderful playing- all 3 protagonists. A truly electric, compelling presence- vivid color, rubato, rythmic intensity. Truly a worldclass group." "The Morgpnstern Trio produeed astute' stylish and yssionate-music-making"